Meet your Hero Kids, it'll Humble You. The T200 Celica and I have a very tumultuous history that dates back a decade. It was the car I’ve always wanted to call my own but never did for reasons that elude me. During my formative years, it was the only car I desired, with the runner ups being a Lamborghini Diablo and a diamond star motors Avenger. The seeds were planted when I bought an old Motor Trend magazine featuring a “150 MPH Shootout” from a garage sale when I was in junior high. It had a small blip featuring the bug eyed Toyota in yellow drab as a long term wrap up. My initial reaction was that was a VERY good looking car. According to MotorTrend comment surveys in the day, 82.6% of participants remarked that they bought the car with the styling being the main factor in that decision. I couldn’t drive then physically, but that didn’t stop me. From the original Gran Turismo all the way to the current GT6 and Forza 6, I’ve always had a bug eye Celica in the stable in FWD, SSII, or WRC Spec trim. I also drove the living hell out of the car in Sega Rally Championship for PC. I never saw these cars in the street when I was young and the closest we got was My dad’s 1991 Corolla. I got to know the car in a way that wouldn’t have been possible for me otherwise. In high school, I literally had a porcelain piggy bank with a picture of a Celica taped to it where I would try to save what I could from my pitiful $6.55 an hour part-time wage. Needless to say, these cars were way out of my price range in that day. When new, the GTs commanded $22.000 in 1994. Accounting for inflation, that’s ballparking $35K today. You would need a suit and tie job to afford one of these. He looks dead inside. Probably because he went for the 1.8 versus the far better 2.2. Fast forward and even with the means to procure such a holy grail, I didn’t buy one. I can count 4 times where I had the opportunity to but never did. Instead I bought a Chevy Beretta that I hold near and dear to me, a Cavalier convertible, a Kia Rio, and a Pontiac Sunfire. All these cars are noticeably missing “Toyota Celica” in their names. What the hell? I’ve thought about this more times than I care to admit. I’m afraid. Deep down inside, I avoided these cars because I’m afraid that it won’t live up to the colossal hype and pressure I put on its namesake. I’m afraid that I’m going to sit in it, drive it, and be disappointed. I didn’t want to ruin that image, that feeling I had when I was young. I wanted to keep it going because I cherished them. I didn’t want to lose that part of me. Last year, my brother sold his 2014 Mazda 6 to CarMax. He then settled on biking to work exclusively. When he got a job further out, the need for a car came to fruition. He did what we all do when we’re a baller on a budget, we peruse Craigslist of the automotive goods. He was first interested in a a rundown 1989 prelude Si 4WS. The car didn’t run because the timing belt snapped while running and the car was rusted to hell. Nevermind that the buyer was asking $1300 for quintessentially the worst example known to man. My brother was legitimately fixated on this “fixer-upper.” I told to wait and you’ll find something, really anything, better than that. A few weeks later, I’m in my driveway connecting the fuel rail on my ‘95 Beretta and he comes out saying that this $500 ‘99 Celica GT popped up and it’s about an hour and a half away and he has to have it. He called the seller, the seller says people are coming to look at it in a little bit and My brother wants none of that. He want’s to beat them to the punch. Not going to lie, I was reluctant and had a healthy dose of skepticism at the price to issues ratio. I tagged along and we headed straight to Compton. Compton Illinois that is. Yes, I saved the original ad (Map omitted for seller privacy). This car was the first Celica I’ve ever drove. We met the seller and to no one’s surprise who’s ever dealt with selling on Craigslist, the original people were a no show. My rational was in an internal power struggle with my ecstatic unbridled joy at seeing the real deal. 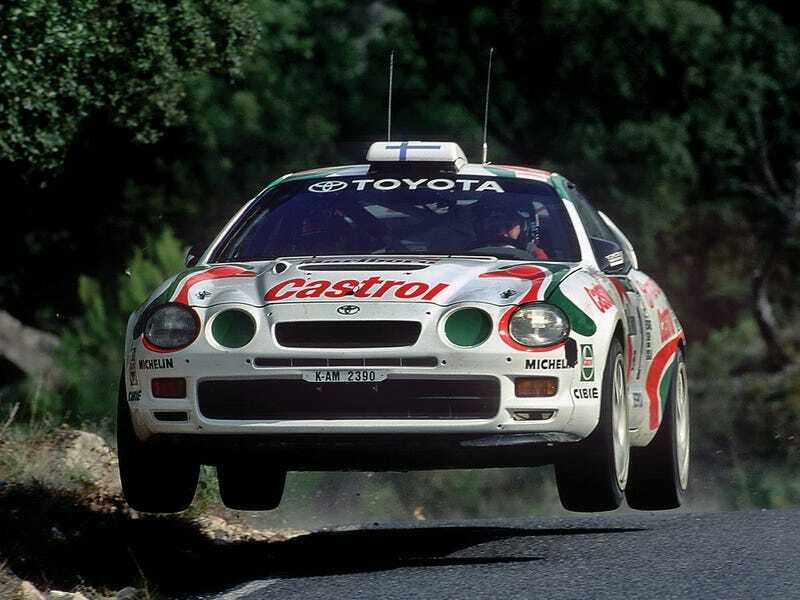 The car had all the typical Celica T200 problems. The gas tank was leaking, the door bottoms had rust, the front subframe had substantial rusting that would be a safety issue if unchecked in a few years. All in all, it was in solid shape and the problems it currently faced could be easily addressed for a few hundred bucks. I have an affinity for American cars but I was utterly blown away by the interior. I’ve never experienced quality on this level. The materials were soft to the touch, the build quality and gaps were fantastic. Coming from GM to this was like night and day. Yet, I passed when my brother offered me to test drive the car. I legitimately had a problem. I could not bring myself to do it. I remained in the passenger seat and while He drove and the engine sounded tired and every bit like it traveled 291,000 miles. I normally don’t care about the license plates being visible and he’s at work so I dunno. l’ll cut them out to be safe than sorry. Pay no attention to him going to town on that tie rod end with an angle grinder. He had good reason. This car when new had high skidpad numbers. It can pull 0.87 lateral Gs stock which is insanely good in 1994 for a FWDer. His newfound car had stickier Direzza DZ102s and TRD springs up front with them also in the back. By back, I mean there are two of them still waiting to be installed sitting in a box in the trunk because the previous owner didn’t get around to it. I finally got into the driver’s seat. It was a whirlwind of emotions. No more running. The culmination of my childhood aspirations and relationship with the T200 comes to it’s event horizon. The leather seat is properly bolstered, hugging me. The leather wrapped shifter fits like a glove under my palm. The headroom is nonexistent. I have to slouch to fit. I drive off with the lady in red. She is a tired car, missing the spark of her youthful years. I want to be gentle to her because even though this is the first time I talk to her, I felt like I’ve known her my whole life. I’ve done this s-bend with my autocross prepped Beretta, oversized swaybars, limited slip diff, and stiffer springs/ struts/ and shocks and sticky compounds. The Beretta driving experience is surreal in that I’ve got it to the point that it is very easy to drive by design. The car in stock from was appalling in the handling department. After dropping a few thousand on it, it’s literally point and shoot in handling. you aim the car where you want it to go and it does so effortlessly. No drama, just precision. This old Celica has no drama left to give but is equally precise as my Beretta. The difference lies in its very DNA. The Beretta is an inexpensive coupe through and through. I masked it’s inherent deficiencies to make it a performer but during its transformation, I took away its humanity. It’s a fun car but it feels very sterile, as if I’m not needed anymore. The T200 is a thoroughbred premium sports car built to handle as is that invites the driver to celebrate with it. A person feels good when they are wanted. This car makes me feel good. The steering is perfectly weighted and the shifts are firm and commanding. The chassis is very communicative, I’m aware of what she’s doing and what she’s going to be doing every step of the way. Though she is worn out, the Celica doesn’t make any excuses. She takes on the S-bend with a smirk, embracing who she is as a handling tour de force. I feel the weight of the car shift to the right and transition left. The engine is in its powerband but there’s something still off about it. She has a smile but it’s a front she’s putting up to mask her fatigue. I back off the throttle before I finish the short bend. The engine finally gave out at over 300,000 miles. We swapped in a lower mileage ‘97 2.2 just last month. No better way to learn about a car than tearing it down!